+ The Rc Fishing Pole , Fishing Line, Bobber, and Hook, Line Release Pads. + A Boat Stand for the Radio Ranger. + Transmitter and Batteries for the Radio Ranger. + 7.2 Volt 1800mah Boat Battery and Wall Charger. + 1 Extra Set of Propellers. The Radio Ranger is Ready to Run right out of the box, just charge the battery and Go Fishing! When reviewing a rc boat especially when you’re using it for fishing is considering the body, (hull) and the electronics inside. Comparatively speaking rc boats range in hull size and what its made of. Second is the electronics and the features. Lets compare hull materials on rc boats and the Radio Ranger. The Radio Ranger’s hull is abs, (Acrylonitrile butadiene styrene ). Discovered during World War II, it is very impact resistant. Abs plastic also provides a lightweight alternative to fiberglass. When comparing rc boat hulls fiberglass hulls although very sturdy, the contribute to the overall cost of rc boat. The Radio Ranger hull is made from vacuum forming two sheets of abs plastic to form a top and a bottom for the boat, then the top and bottom are glued together. “Hobby Grade or Not”? 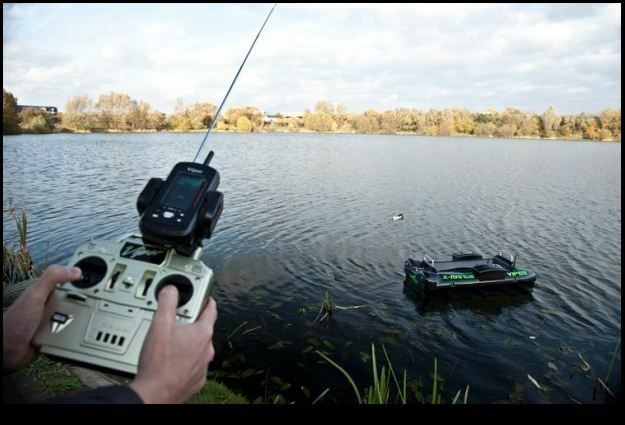 The electronics are also a factor in rc boat performance, the question is how many features do you want in a rc boat you’re going to use for fishing? The Radio Ranger provides a very simple radio control system, no needless features to drive up the cost either. The Radio Ranger electronics give you a 300-400 foot range, and the ability to go straight, left and right. What you do not get which a “Hobby Grade” rc usually boat has are features like: water cooling for the motors, a servo steering system, and an esc, (electronic speed controller). A common question about the Radio Ranger, “Is the Radio Ranger a Hobby Grade Rc Boat”? The answer is no. For one a true “Hobby Grade” rc boat that is almost 3′ feet long is going to cost in the neighborhood of $300-$400. One thing also is do you need a hobby grade rc boat for fishing, no. When using a rc boat around the dock or shore for pulling fish in with the boat a hobby grade rc boat could be considered too elaborate, you just don’t need a hobby grade rc boat for that. The other factor is the range and taking your line out record distances, then it is a matter of your preference. For taking your line out again a hobby grade rc boat is not necessary but one nice feature on hobby grade rc boats is the esc, (electronic speed control). The esc enables you do drive the boat at any speed, instead of just one speed. The Radio Ranger is a one speed model, gets the line out fast. A trick to slow the one speed rc boats is instead of the 7.2 volt battery is to use a smaller one like a 4.8 volt battery. It will reduce the speed to a nice trolling speed while still giving you the desired running time depending on the mah the battery has. The Radio Ranger package includes everything you need to get started, whether using the boat for fishing or just a fun rc boat. With the boat battery and charger included, and the 8 AA Batteries included for the transmitter, and The Rc Fishing Pole included, and a 2 year parts and labor warranty from Fish Fun Co. you can’t go wrong.